Novelty bets are the most unusual betting options offered by the major online betting sites. If you are looking for different betting options than sports and politics, novelty bets are fore you. Novelty bets have previously proven that the online betting industry experts are keen to challenge the imagination of bettors. Previously we covered the most unusual things people bet on which include the name of the royal baby, next US president, and also the existence of aliens. In this article, we will reveal the best novelty bets of 2017 and how to wager novelty bets online in the USA and Europe. As a matter of fact, some of the major online betting sites have gone far enough to accept bets on the size of Donald Trump’s male organ (it is a matter of curiosity how they actually discover the truth without asking Melania Trump), first celebrity to die and which landmarks will be banned for Pokémon Go fans first. And there are also some crazy bettors who staked their wives and houses on football games. However, you don’t need to compete with such extreme bettors while betting on the best novelty bets of 2017. 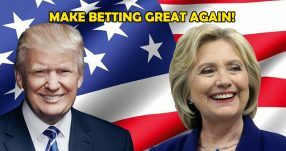 The casino magnate Donald Trump not only managed to defeat his opponent Hillary Clinton but also the online sportsbooks which failed to predict the Republican candidate’s success in the previous US Presidential Election. He will assume the office later this month and the popular US online sportsbook MyBookie Sportsbook accepts bets on Trump’s first state visit. The popular online sports betting site claims that the first visit will be either to Russia or Mexico as the both countries are granted the same odds +190 (2.90). It makes sense considering the fact that Trump aims to enhance the US-Russia relations after receiving open support from Vladimir Putin during his presidential campaign. He may also visit Mexico to discuss architectural design of the wall that he is aiming to build between the two countries. The next strong candidate for Trump’s first visit is Canada which has the odds +280 (3.80). As the newly elected president will be busy, he may consider starting with a short trip. Israel follows Canada with the odds +330 (4.30) as the Middle Eastern state received Trump’s support recently after being warned by the UN due to expanding the residential areas in East Jerusalem. You can also bet on the predominant color of the tie will be worn by Donald Trump during the inauguration ceremony. MyBookie Sportsbook’s favorite color is red which has the odds -140 (1.71) while blue has the second favorite color with the odds -110 (1.91). If you believe he will wear a gold or yellow tie, then you will get the odds +300 (4.00). If you think he will wear a tie with Tweety Bird on it, you’d better bet on the latter option. Click her to bet on Trump’s first state visit and tie color at MyBookie Sportsbook! The British Monarch Queen Elizabeth II has missed several Church services lately due to her health problems. The media started to discuss who will be the next monarch after Queen Elizabeth II. According to the famous UK online betting site William Hill, Prince Charles will assume the post after the Queen, with the odds 1.33. His son Prince William’s odds to be the new monarch are 3.25. Prince George and Prince Harry’s odss to claim the highest position are 26.00 and 34.00 respectively. Kate Middleton’s chance to be the new queen doesn’t seem to be likely; at least not in this decade. Otherwise, it would be the most surprising novelty bet of the year. Click here to bet on the next monarch after Queen Elizabeth II at William Hill! Whenever a pope passes away, the whole world wait for the white conclave smoke. When you see it next time, you can actually come into fortune betting on the next pope after Pope Francis. The famous UK online sportsbook PaddyPower accepts novelty bets on the next pope after the Argentine. It seems like Cardinal Luis Antonio Tagle is the strongest candidate with the odds 6.00. He is followed by Cardinal Marc Ouellet and Cardino Peter Turkson, both have the odds 9.00. Archbishop Angelo Scola and Cardinal Sean OMalley have the odds 11.00 while Cardinal Christoph Schonborn’s odds to be the new pope are 13.00. It may be hard to guess the next pope but betting on the next pope online definitely adds more excitement to the next papal election. Click here to bet on the next pope after Pope Francis at PaddyPower! You can also check the online free bet offers and the online sportsbook reviews to find the most suitable betting bonuses to wager novelty bets online in 2017.